In one of the most remote corners of the planet, home to the purest water and cleanest air, live ancient plants and animals most of us will never see. But that shouldn’t stop us trying. Roderick Eime, ventures to northwest Tasmania in search of prehistoric mysteries. This comical encounter is described, not by some over imaginative bushwalker, but by a group of picnickers out for a Sunday stroll in the northwest of Tasmania. The year? 1893. As it turned out, it was a close call for the Thylacine, not so much for poor George. This remote and inhospitable northwest corner of the island now called Tasmania, has lost none of its wilderness appeal and is home to the some of the last and largest temperate rainforests on the planet. But the destructive practices of the last two centuries are not completely behind us. While logging has been suppressed in the old growth regions for now, mineral extraction still presents a threat and the contentious Riley Creek Mine is the focus of conservationists’ efforts. Controversial author and global warming activist, Professor Tim Flannery, is another staunch defender of this embattled forest region. Today, that corner of Tasmania northwest of Cradle Mountain is one still a vast wilderness with the Savage River National Park its centrepiece. The rest is a mixture of state reserve and conservation areas and was once abuzz with miners and loggers hell-bent on nothing but profit. The Savage, Whyte and Pieman Rivers north of Zeehan is where their riches lay. The largest nugget of gold discovered in Tasmania was 243 ounces (7.5kg) and came from Rocky River, a small tributary of the Whyte in 1883. In the midst of this frenzy, the village of Corinna sprang up and quickly earned a reputation as one of the toughest towns anywhere in the region – and that was a pretty big call back then. At its peak in 1893 there were 30 buildings of one sort or another including two pubs, a post office, numerous stores and shops, slaughter yards and several residences, all supporting a boisterous population of some 2500 people. By the time Federation was proclaimed, Corinna was out of easily recoverable gold and in decline. For most of the entire 20th century, Corinna was the home to just one family at a time, operating a small store and the ferry across the Pieman River. The last family in residence, the Polsons, sold their leasehold to a consortium of environmentally proactive businessmen in 2005. Since then, Tarkine Wilderness Pty Limited has dedicated its efforts toward creating a world standard eco-retreat for visitors to escape the pressures of city life and rediscover a place almost overlooked by the rest of the world. 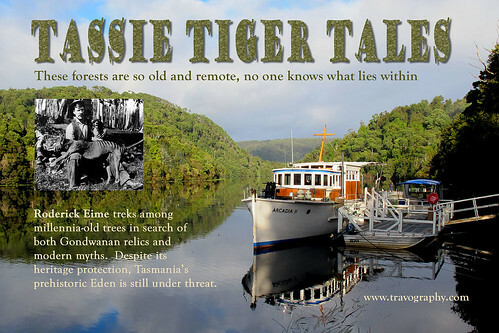 In 1937, after the death of the last known Tasmanian Tiger in Hobart Zoo, the region north of Corinna for some 80-odd kilometres was proposed as a Thylacine sanctuary and many locals are steadfast in their belief that a population, however small and fragile, still exists in these impenetrable forests. Guests at The Corinna Wilderness Experience can indulge themselves in any number of nature-based relaxation activities. 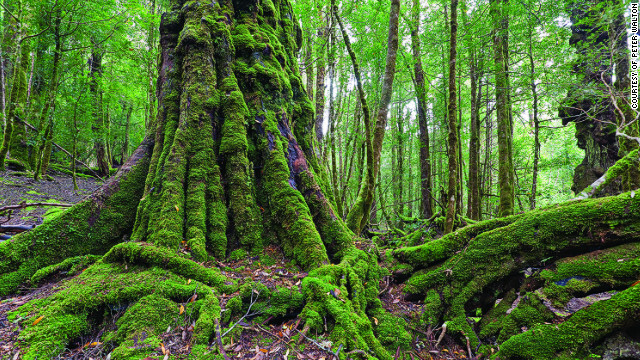 There are plenty of walks in amongst the forests where the botanically-minded will spot such species as leatherwood, celery top pine, sassafras, king billy pine, huon pine, myrtle beech, pencil pine, native laurel, soft tree fern, slender tree fern, blackwood, cutting grass, native plum, whitey wood and the commonly named, “horizontal”. Among the And then there’s the most amazing fungi you will ever see – great vivid and spongy plates forming bulbous lips from fallen trees – some 60 species in all. There’s a walk for every day of the week, each beginning and ending at the comfortable and convivial, but Internet-free Tarkine Hotel with its superb Tannin Restaurant, operated by chefs of considerable standing. Understandably nomadic, the kitchen is currently staffed by Euan Wiseman and his partner Jacqueline who nevertheless excels in his use of locally sourced produce like Red Cow milk, Cape Grim beef, Black Ridge Farm bacon and sausages and Mathom yoghurt, all matched to a great selection of Tasmanian and mainland wines. An oft cited highlight is a half-day cruise along the Pieman River almost to the ocean aboard the magnificent Arcadia II, a 17m huon pine craft built in 1939. In more than 75 years, she has had a colourful career, including war service in PNG and time scallop trawling out of Coles Bay. In the late evening, after a suitably satisfying repast, just sit out on the balcony, watch the tiny wallabies fossick and listen to the minute sounds of the forest while a riot of stars and galaxies scream from the heavens. Oh, and that piercing, throaty howl from deep within the ancient timbers? It’s probably nothing. A half-day roundtrip cruise aboard Arcadia II is $90/head inc. lunch. Kayaks can be hired for $10/hr. Barge crossing is $20 for regular vehicles. Flight access points are via Launceston, Devonport and Burnie airports. 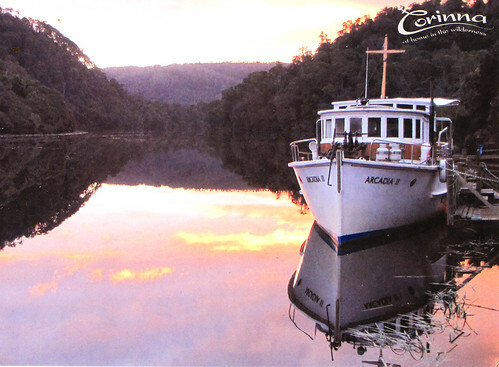 Corinna is accessible by normal 2WD motor vehicles, with the town reached from the south by crossing the Pieman River by car barge. It was July 2005 when sharp-eyed Sydney-based businessman and nature lover, Max Ullrich, learned that his favourite Tasmania retreat was for sale. Driving across the Pieman River punt, Max got talking to then owner Phil Polson and learned Corinna was up for sale. The Polsons had been there for many years and were finding the isolation a bit hard going. There is no power, telecommunications are patchy and bringing supplies can be troublesome and expensive. None of this fazed Ullrich and he was soon talking to mates Ken Boundy (then CEO for Tourism Australia) and Tony Hargreaves, a builder, as well as another who was an accountant. By September of that year, Corinna was theirs. Yet it’s been anything but a walk in the park for the four partners. Corinna’s isolation creates at least as many challenges as attractions for the management. “It’s been a huge job,” says Boundy, “Getting good staff to stay for any length of time is always a challenge. Attracting the right guests and managing their expectations is always on our minds. Talking to the visionary men behind Corinna, it seems their only real regret is not being able to spend more time there. “Hopefully that will change soon,” says Max with a twinkle in his eye.